If you managed to finish your basement floor, you can transform it from being an unused area into a livable space which creates a warm and comfortable environment. A basement floating slab floor is basically not a floor but a poured concrete on top of an underlying soil. A concrete slab floor does not allow you to glue or nail anything onto it. However, you can simply lay down laminated flooring planks on top of the concrete slab floor which always feature tongue and groove edges that can be locked together for creating a seamless assembly on top of the concrete’s surface. The laminated planks can provide you with a warm and comfortable area to live in instead of having cold and hard concrete floating slab flooring. Below are some of the steps that you should know whenever you want to finish a basement by using a floating slab floors. First thing that you need do is to sweep your unfinished basement floor. This is to remove any accumulated dirt, dust and debris. You must make sure that you unroll the underlayment over the cleaned surface. You need to unroll it in sheets so that it would be able to overlap each other at the edges with at least 3-inch length. Then, you can proceed by taping the edges of the sheets before cutting the foam underlayment so that it can fit around the edges of your basement floor simply by using a utility knife. Always protect yourself by wearing safety glasses along with thick gloves especially when you are cutting your floor planks into small sizes. Next step that you need to do is to lay down the first or starter course along your longest and straight wall in the basement. Ensure that the groove sides are facing the wall. You need to create space for the planks in this course at least 1/4 inch apart from your wall. Then place plastic spacers between the wall and boards in order to produce an expansion gap. The last board should be cut to fit the available area on your floor and also maintain the 1/4-inch gap between its end and also the adjoining wall by using a handsaw. 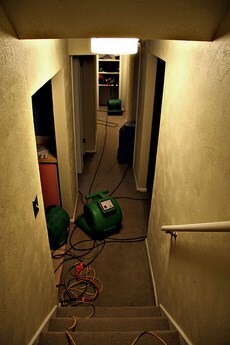 You must also ensure that there is no water leakage at the basement where it could damage your flooring. In order to determine whether there is any leakage or not, you need to do a taping of 1-by-1-foot piece of plastic onto the concrete slab and then leave it overnight for at least 24 hours. You will be able to know whether your basement has moisture problem or not. If you notice that water seems to be appearing on the plastic after the 24 hour time frame, you need to immediately treat the concrete slab with a sealer. Once you have finished the first course, you can proceed with the second course using the half plank from your previous course to make sure that the lines do not match up. The grooved sides of your planks need to be slide into the tongue sides of your planks from the previous course so that it is secured together. This process need to be repeated in order for you to lay down the rest of your remaining courses of flooring planks right until you lay down the last course. When you have reached the last course, you need to trim the tongue sides of your planks of flooring in order for you to be able to fit it according to the available space. Make sure that you maintain at least a 1/4-inch gap between your flooring planks against the bordering walls. After that, you need to measure and cut your flooring trim so that you would be able to install around your floor’s perimeter. Ensure that you set the trim against the wall and flush just above your flooring planks. Then, nail them onto the adjacent wall by using trim nails. The trim should cover any of the exposed expansion gap between your flooring plank’s edge and the wall. You must repeat the above process of installing your floor trim around the basement floor. You might require filling any low spots in your unfinished basement floor by using floor-leveling compound. By doing this, you would be able to smooth the surface that you are going to work for the project.